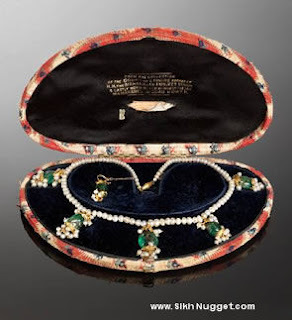 An important 19TH Century emerald and seed-pearl Necklace from the Lahore Treasury, reputedly worn by Maharani Jindan Kaur wife of Ranjit Singh, the Lion of the Punjab (1780–1839), is for sale in Bonhams next Indian and Islamic sale on 8th October 2009 in New Bond Street. LION OF THE PUNJABThe necklace has six polished emerald beads, one later converted to a pendant, each bead gold-mounted and fringed with seed-pearl drop tassels, fastened with a gold clasp. It comes with a fitted cloth covered case, the inside of the lid inscribed: “From the Collection of the Court of Lahore formed by HH The Maharajah Runjeet Singh & lastly worn by Her Highness The Late Maharanee Jeddan Kower” It is estimated to sell for £25,000-35,000. This rare necklace comes from the Collection of Maharajah Ranjit Singh and Maharani Jindan Kaur (1817-63), which was sold by Frazer and Hawes from Garrards, Regent Street, London. Between 1849 and 1850, when the British took control of the court in Lahore, they entered the Treasury, where they found the court jewels wrapped in cloth. The Treasury was fabled to be the greatest and largest treasure ever found. The most famous and well-known jewels were taken away as gifts for Queen Victoria, including the Koh-i Noor and the Timur Ruby. The Maharani Jindan Kaur was born in 1817 in Chahar, Sialkhot, Punjab. Of humble origins, she was the daughter of Manna Singh Aulak, the Royal Kennel Keeper at the Court of Lahore. She grew into a young lady of exquisite beauty and came to the attention of Maharajah Ranjit Singh at a young age. Manna Singh was reported to have pestered the Maharajah, promising that his daughter would make him youthful again. In 1835, she became Ranjit Singh’s seventeenth wife and in 1838 bore him a son, Duleep. Duleep was his last child and just ten months later Ranjit Singh died following a stroke. Jindan was the Maharajah’s only surviving widow, rejecting the practice of ‘Sati’ or throwing herself on the funeral pyre with his other wives, choosing to bring up her young son instead. Ranjit Singh’s empire stretched from the Indian Ocean to the Himalayas, with its southern boundary bordering British India. His court was fabled for its patronage of the arts and sciences, and for its riches. The Russian painter Alexis Solykoff wrote on visiting the court: “What a sight! I could barely believe my eyes. Everything glittered with precious stones and the brightest colours arranged in harmonious combinations”. Upon the Maharajah’s death, his body was carried through the streets to his funeral pyre in a golden ship, “with sails of gilt cloth to waft him into paradise’. 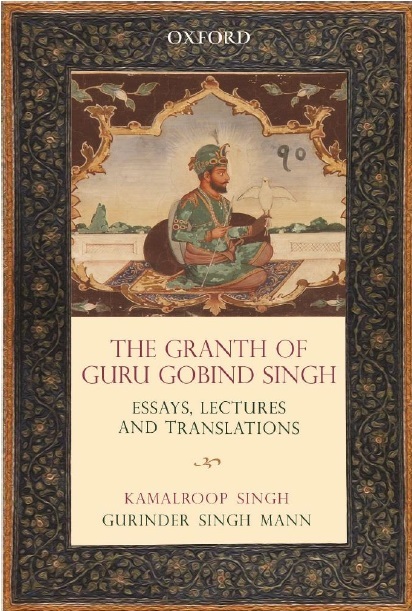 Immediately after his death, Ranjit Singh’s golden empire began to crumble. His eldest son, Kharak Singh took the throne, but was murdered two years later; the reign of Sher Singh was similarly short-lived and he was assassinated in 1843, upon which Duleep was proclaimed Maharajah at the age of five, with his maternal uncle as Prime Minister and his mother, Jindan, as Regent. His uncle’s position as Prime Minister was brief, after the Khalsa Army declared him a traitor and killed him. As Jindan came to power, she was swiftly confronted by the British army that had moved to her southern border in the hope of conquering one of the last independent states of northern India. As Regent, Jindan became a thorn in the side of the East India Company. She waged two unsuccessful wars against the British, the First and Second Anglo-Sikh Wars of 1846-49, which brought about the annexation of the Punjab. In 1846 she was deposed as Regent and in February 1847 the British took possession of the capital, Lahore, installing Sir Henry Lawrence as British Resident to oversee their affairs. The British continued to see her as a major threat to their control of the Punjab, since she was instrumental in organising Sikh resistance, rallying her armies to battle and plotting rebellion against the British. Thus in August 1847, to halt her influence on the young king, Duleep was sent away from the palace and Jindan was ordered by Sir Henry Lawrence to the Summan Tower of Lahore Fort and was then was incarcerated in the fort at Sheikhurpura. After being moved around several prisons, in 1849 she escaped from British captivity at Chunar Fort, leaving a note for the British: “You put me in a cage and locked me up. For all your locks and your sentries, I got out by magic….I had told you plainly not to push me too hard – but don’t think I ran away, understand well that I escape by myself unaided…When I quit the fort of Chunar I threw down two papers on my gaddi and one I threw on a European charpoy, now don’t imagine I got out like a thief!”. Disguised as a beggar woman, she fled to the Himalayas, where she found troubled sanctuary in Kathmandu, Nepal. All her jewels and gold that had been left in the government treasure in Benares were confiscated, with the added threat that if she went to Nepal she would lose her pension as well. In Kathmandu, she lived under the protection of the Nepalese King and government, and spent her time studying scriptures and doing charitable work through a temple she had built near her house. Life was not easy for her and she was kept as a virtual prisoner with a meagre allowance. Under pressure from the British officials at Kathmandu, who portrayed her as dangerous with her alleged efforts to create disaffection against the British, the Nepalese imposed humiliating restrictions upon her. In the meanwhile, the British press began a campaign to blacken her name, calling her the ‘Messalina of the Punjab’, a term first coined by Governor-General Lord Hardinge. Like Messalina, the wife of the Roman Emperor Claudius, Jindan was portrayed as a licentious seductress, who was powerful and influential, and too rebellious to control. The young Maharajah, Duleep, was moved to Fategarh, where he lived under the guardianship of Dr John Login and his wife, and eventually arrived in Britain in 1854, at the age of sixteen, where he was adopted as a godson by Queen Victoria. Under the influence of the Logins, he converted to Christianity and was brought up as a young English gentleman. In 1860, Duleep sent his native attendant to Kathmandu to find out about his mother and a report came back through the British resident at Nepal that: “The Rani had much changed, was blind and lost much of her energy, which formerly characterised her, taking little interest in what was going on”. The Governor General agreed to a meeting based on this report of the Rani’s condition, thinking that the last queen of the Punjab no longer posed a threat. In 1860, tired of her exile and isolation, and the indignity she was made to suffer, she travelled to meet her son in Calcutta. For the first time in thirteen and a half years, they were reunited at Spence’s Hotel in January 1861. Duleep found her almost blind and suffering from poor health. He offered her a house in Calcutta, but she expressed her wish to stay with her son, following years of enforced separation. And so it was agreed that the Rani would travel to England. Her private property and jewels, previously taken by the British authorities, would be restored to her on the basis that she left India and in addition she would be granted a pension of £3,000 per annum. Her jewels were returned to her at Calcutta at the start of the journey. On the 1st August 1863, Jindan died in her Kensington home in the country of her sworn enemy, just two and a half years after being reunited with her son and leaving him inconsolable. In 1864, permission was granted to take the body to India, which had been her dying wish, and she was cremated at Bombay (Duleep was not allowed to go to the Punjab), her ashes scattered on the Godavai and a small memorial or samadh erected on the left bank. In 1924, her ashes were later moved to Lahore by her grand-daughter Princess Bamba Sutherland, and deposited at the samadh of Ranjit Singh. Finally the ‘Messalina of the Punjab’ returned home to rest.